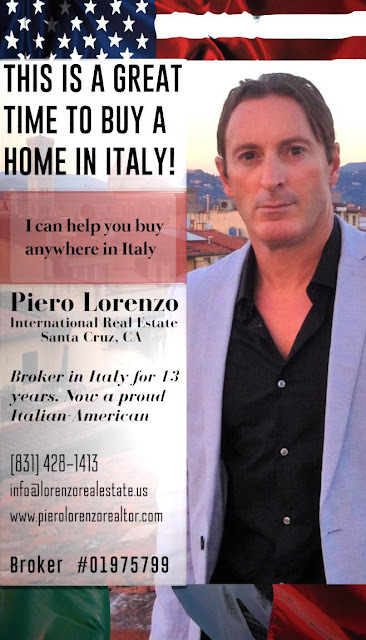 Today I would like to mention several websites related to a California Broker, CIPS realtor, specializing in Italian Real Estate. Few years ago we had opportunity to rent an apartment thanks to his intermediation, with satisfaction, in Florence. Consider that after 13 years as a Real Estate Broker with his own agency, Prince Immobiliare (Florence) he moved, with his wife, to hometown of Santa Cruz, California, in February of 2015. It is important to remark that he have italian Real Estate License and a Californian Real Estate Broker License too. Afterward, if you are going to sell your home, consider that he has a global real estate, he is GPS (Global Propery Specialist) member and a CIPS (Certified International Property Specialist) designee helped by an huge network of colleagues all over the world to help find buyers. Finally you should consider that his personal real estate history was mentioned on this important Italian newspaper. This article was discussing about fact that several Italian talent s guys left their country to find more job opportunities and to have their talents recognized and rewarded as well.